Time for another Read Aloud Thursday. Usually I post my RAT posts over at Reading My Library in conjunction with that challenge. However as I mentioned I would do, if Bookworm1 and I read a chapter book, I'll talk about it over here! These chapter books are from our home bookshelves and generally are titles that I've been saving and hoping that we'll be able to get into sooner rather than later. Bookworm1 (age 4) isn't entirely into chapter books just yet, truth be told. Generally speaking, he complains that they are too long. But he will tolerate a "short" chapter book and if you promise an incentive for reading it, he'll generally take you up on your offer. I picked up a copy of The Littles Take a Trip at some point and had it sitting around, waiting for our attention. I plucked it off the shelf a few weeks back because I thought it would meet his criteria of being short while meeting my criteria of being a story with substance and therefore interesting as a read-aloud. On both points I was correct. I had never read any of The Littles stories before so this was all new to me. In case they are new to you, here's a bit of background on them. 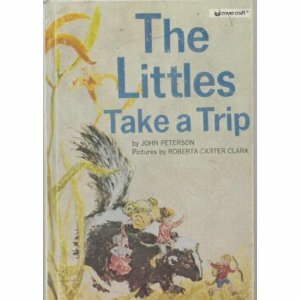 Written by John Peterson, the first book in the series simply titled The Littles was published in 1967. The Littles are tiny people who live in the walls of human homes. The Littles also have tails causing them to resemble mice in some ways (which may explain our instant liking of them!) The Little family lives in the home of the Bigg family which, if you are a fan of puns and irony, you'll enjoy. The children's names are Tom and Lucy Little and they have a variety of friends and relations. As I mentioned, we picked up The Littles Take a Trip which is not the first book in the series but we had no problem in wrapping ourselves up in the story. In this particular episode, Tom and Lucy Little are bemoaning the fact that they have no friends to play with. All the other small families live in different homes and they never get together because travel amongst the big people is simply too dangerous. Only one small person - Cousin Dinky - is brave enough to travel among the small people and he delivers mail between all of the families. Tom and Lucy envy Dinky his freedom and fellowship with other small people. In this story the Little adults are made aware of the fact that times are a-changin' and the young fry are really very eager to establish connections between smaller families and have friends and fellowship that has never been had before. The adults all decide to make a trip to spend time with all of the other small families and so the Little family sets off on their adventure to join in on the fun. However, as I mentioned, travel in the world can be quite dangerous if you are only 4 to 6 inches high and they run into a fair number of scrapes when on their journey. That's all that I will say about this particular story, so as to avoid spoilers. I will tell you that both Bookworm1 and I both very much enjoyed this book. A few subsequent trips to Goodwill later, and we find ourselves in possession of a few additional titles in the series. I was happy to find a copy of The Littles Go Exploring for $0.99 at Goodwill and pulled it off the shelf to ask Bookworm1 if he'd be willing to read another Littles story with me. His response? "Yes, let's get that one. I like ALL the Littles stories." So there you have it, folks. If that's not a ringing endorsement from Bookworm1, I honestly can't tell you what it is! We look forward to more Littles adventures! If you haven't yet checked out their stories, we both highly recommend them! To find out what others are reading aloud with their children, visit Amy at Hope is in the Word to gather up some new ideas! I was thinking The Littles would be too long for us, but I may have to revisit that thought with that endorsement! Are these the same Littles that used to be a cartoon in the 80s? I LOVED them!! I have never seent these books, but they look great! Thanks for highlighting them! These are wonderful books! My kids enjoyed them when they were little 20+ years ago. It's nice to see the good old books getting some attention! Amy - Yes, I believe so. (I never saw those either! Neither have I ever read the books.) But what I saw online indicated that the 80's cartoons were based on these original stories by John Peterson. After we make our way through some of the other stories picked up, I'm very curious to look into the cartoons to see how well they follow the books. Kathy - It's so fun to find books like this to share with kids. I LOVE older titles (more so than new) and so if you have any other suggestions to make, I'm listening! Ronan picked out a Noddy the Elf chapter book at the Corvallis library a few months ago. It was a little long for him but we read it in sections and he enjoyed it. I had never heard of Noddy. It had pictures, not just words. as they look fun and interesting! Thanks for the (as always) intriguing and bookshelf expanding review! Oh! The Borrowers! Now I know whose brain to pick about those. I never read those either. So...I'll e-mail ya! I'm not sure if I read The Littles as a kid but I do remember enjoying the show. I DID read The Borrowers (and had a copy that has disappeared). I remember enjoy that book but it's been a long time so don't take that as a recommendation. I'll have to add these to our list of read alouds!